Uniquely interpreted from a classic percussion instrument, Lilypad Cymbals encourage musical experimentation and safe, inclusive play. 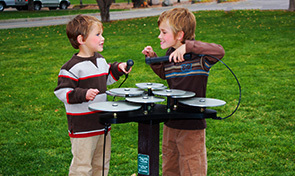 This 3-sided outdoor instrument features a wide, layered surface area composed of 10 anodized aluminum cymbals. The artistically arranged overlapping tiers of cymbals eloquently resonate sweet bell tones and only ring for a fleeting few moments before dissipating. 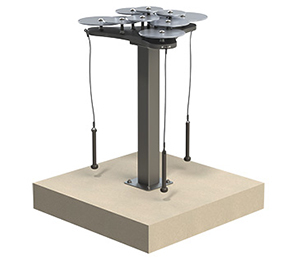 Lilypad Cymbals are supported by a weather resistant HDPE frame and are very popular as a standalone addition to parks, playgrounds, school recess spaces or as a rich accompaniment to other outdoor musical instruments. 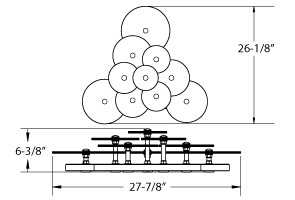 3 mallets are included and attached to the frame.